Thames Turbo Sigma Sport Launch 2007, originally uploaded by rogerbarr99. 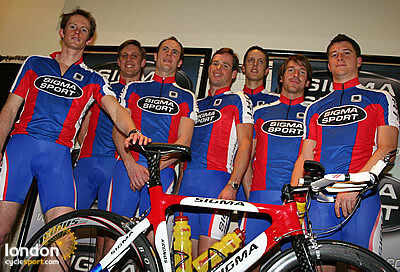 Tonight the girls and boys of the Thames Turbo Sigma Sport team went to the 2007 launch. We picked up our Specialized goodies and posed for the cameras at the Sigma expo. It was nice actually as last year I went along as a spectator. We were introduced by Eurosport commentator Dave Harmon. He's a cross between Warren Evans and Euan Lees!